A few months ago, I was delighted to receive an invite from Katie O’Rourke to try out the audio book version of her novel, Finding Charlie. I took her up on it and listened to my very first audio book. I am now OMG hooked on audio books and listen to them all the time. But enough about me. I’d like to introduce you to Katie. Katie writes contemporary women’s fiction, so I figured I’d love her from word one, and I was right. I’m sure you’ll love her work as much as I do. First off, Katie has extended an offer to my readers. The details were in my August 2018 newsletter, so if you missed it, drop me a line at jeannefelfe@gmail.com (put Katie in the subject line) and I’ll get you hooked up if it’s still available. Katie, what is something readers might want to know about you. I’m a hybrid author. 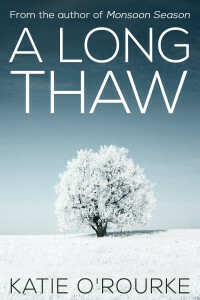 My debut novel, Monsoon Season, was traditionally published along with A Long Thaw, which I later rereleased on my own. Finding Charlie, was chosen for publication by KindleScout in 2015. 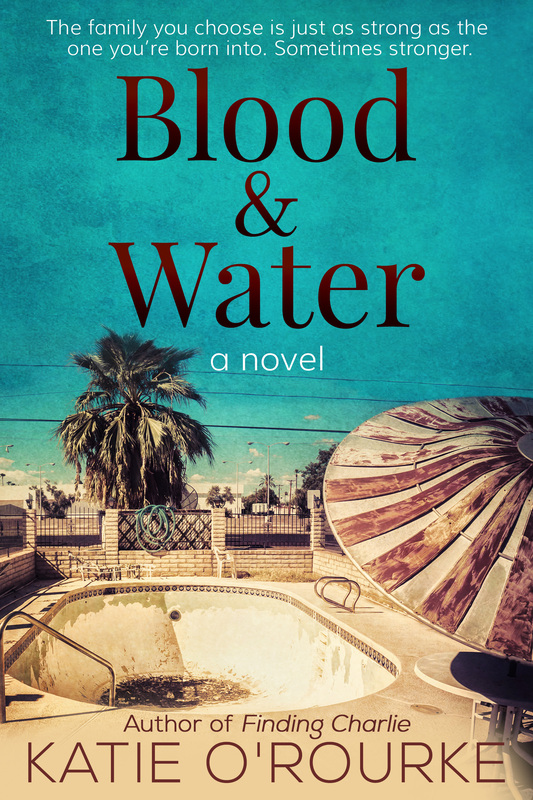 My fourth book, Blood & Water, was released last year. I write family sagas with overlapping characters, so they’re all connected. Hmm… now I’m wondering if this one is about blood being thicker than water. I can’t wait to read it — it’s coming up on my TBR list soon. Name a book that made you cry. I haven’t read that yet, but want to. My first book was published in 2012. Since then, I’ve written with a more serious eye toward publication. Another one I haven’t read yet. I just checked it out—looks like a debut novel that I might have to take a peek at. What was the hardest part of writing Blood & Water? I started Blood & Water in 2016, but it’s set in 2017. Once Trump won the election, I didn’t know how to write a story set in America, especially in a border state, with what felt like such a volatile, precarious future. I bet that would be difficult. Tell us about your main characters? Were they inspired by real-life? Something I only realized when I’d finished is that Blood & Water is very much a love letter to the deepest friendships of my life. The character of Ally serves as a composite of those real people. Don’t you just love it when your writing surprises you like that? I know I do and my characters are always throwing new twists my way. What is the most special thing a reader has said about Blood & Water? I like when I’ve created characters who connect to the reader. One of my recent reviews for Blood & Water said she was sad to see them go. That’s what I like to hear. I read all my reviews. I don’t understand writers who don’t. Isn’t the point of writing a book to connect with readers and hear their response? I think negative feedback can be helpful and I don’t expect every reader to love my work so it never really hurts my feelings. I’m kind of like that so far in my writing journey. Each review makes me think about how I can improve in my future writing. And I feel like if someone is going to take the time to leave a review, I should acknowledge that by reading it. Yep. Sometimes it’s a nerdy writing reference that only other writers will get. Most often, it’s something I’ve worked hard to make subtle and then get frustrated when nobody notices. In my last book, I repeated certain lines in different character’s POVs. I worried readers might think it was accidental, but—so far—no one has noticed. Ha! Now I’m going to be watching for it. Katie, thank you for taking a little time to chat with me.